The QTW150 manual gearbox has been designed with simplicity in mind, resulting in a robust design with manufacturing optimised to deliver reliability and consistent performance. 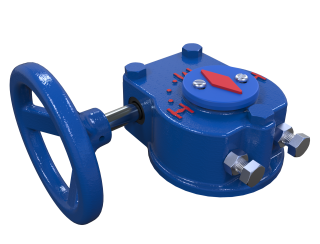 The QTW150’s simple, rugged construction makes it an ideal choice for quarter-turn valve applications. The QTW150 quarter-turn worm gearbox is intended for the operation of ball, butterfly, plug and any other quarter-turn valves. These gear operators are well suited for applications in waterworks, chemical, power, HVAC and most general industrial applications. See QTW150 Literature Page for further details.